Local area networks :(LAN) is a network that connects computers and devices in a limited geographical area such as home, school, computer laboratory, office building, or closely positioned group of buildings. 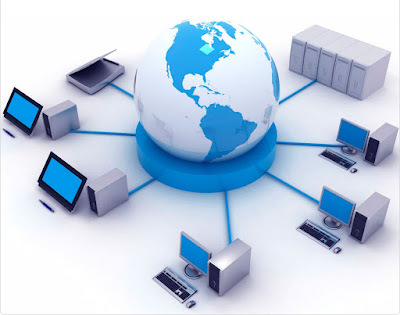 Wide Area Networks: (WAN) are used for local area networks, where the computers are physically linked to each other. A network interface card (NIC) must be fitted to a personal computer before it can be connected through wires to local area net work .The most common type of NIC is an Ethernet card. Wired network connections can be defined as a jack in which we plug a network connection and hence a wired connection is established. Wired network connections are similar to the phone jacks except for the size. Network jacks are yellow and orange in colour. Wired network allows for the fast and easy access to the internet. All the wired networks are full duplex, switched. Peer to peer Network: Peer-to-peer is a communications model in which each party has the same capabilities and either party can initiate a communication session. Other models with which it might be contrasted include the client/server model and the master/slave model. In some cases, peer-to-peer communications is implemented by giving each communication node both server and client capabilities. In recent usage, peer-to-peer has come to describe applications in which users can use the Internet to exchange files with each other directly or through a mediating server.